Let’s be honest–the best part of any Thanksgiving celebration is cooking a ginormous smorgasbord of food and then heartily stuffing your face until you succumb to a righteous food coma. It would be unpatriotic to think otherwise. But what do you do when it comes to treating your favorite feline to a similar spread? Well, you could pop out and pick up some of those Thanksgiving-themed cans of wet food. You know, the ones that promise to deliver up a cat-centric take on turkey and vegetables. Or you could really step up and attempt to cook a holiday meal that both you and your cat can enjoy at the same time, thanks to a bit of foresight and trickery. 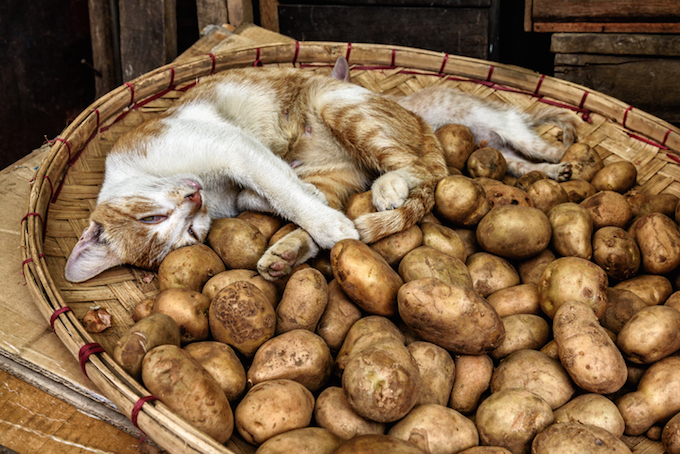 Obviously, there are many human food that can be toxic and dangerous to cats. 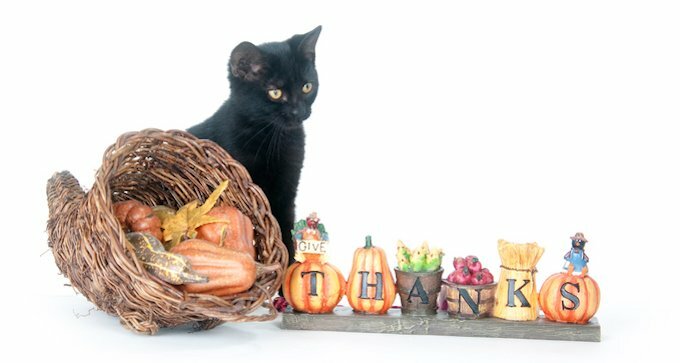 To that end, when conceiving a communal Thanksgiving menu, let’s take heed of the common foods listed on both the ASPCA and Humane Society websites and use them as a no-go list. Among the items are alcohol, sugary foods, and dairy products. Now, let’s deal with the bird. Cats can chow down on turkey, but the problem here is that much of the stuffings and herbs you’re gonna be plumping and basting the bird with could pose a problem to your cat. Garlic, onions and chives are definite no-nos, and we should also exercise caution with other common herbs like rosemary, thyme and sage. Also, salt is not recommended for your cat, so any thoughts of brining the bird are out. Unfortunately, due to the recommendation that cats avoid dairy, fatty meats, and even parts of mushroom plants, any gravy you’re going to be tenderly stirring together for yourself should not be used to garnish your cat’s Thanksgiving turkey. Instead, grab a can of their favorite wet food in gravy and slowly siphon the sauce from the meat parts. Sure, this might seem a little humiliating, but your cat is gonna appreciate it when you top their turkey with a hearty dollop of feline-friendly gravy. When it comes to sides, basic is the way to go once again. If you’re making mashed potatoes, feel free to dish some up for your cat, but only before you’ve added in any seasonings and luxurious heaps of milk, cream, or even some five-year cave-aged gruyère for your own taste buds’ benefit. Take the same approach to the traditional sweet potato dish. Throw an extra small one into the oven and roast it for 40 minutes while you’re cooking the bird, then peel and serve up a tiny helping of orange deliciousness to your cat. Also, pumpkin is good! 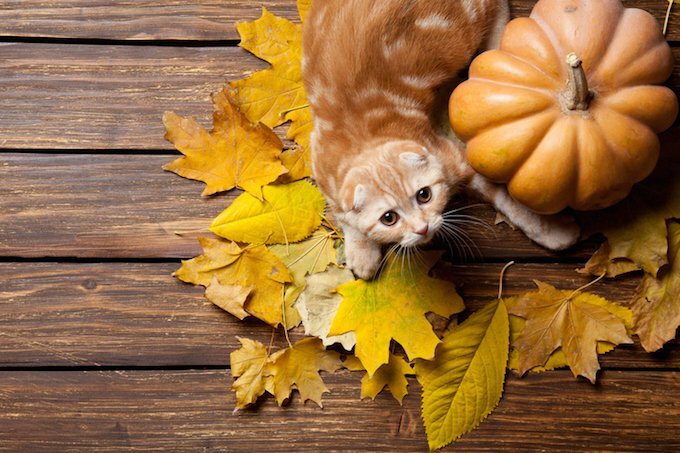 Go the cheat sheet route and save some of the canned pumpkin you might be using for a pumpkin pie and add it to your cat’s bowl. 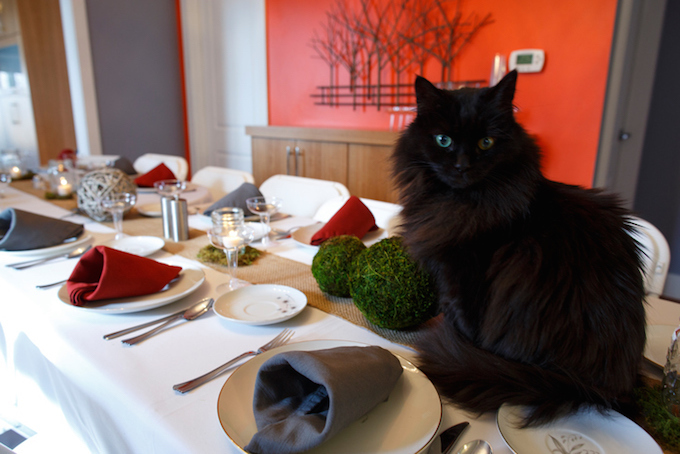 At this point, you’ve got the makings of a mini Thanksgiving feast to serve to your cat. Sure, sides and condiments like cranberry sauce and your family’s age-old take on the classic green bean casserole are off the table, but once your kitty is face deep in gravy, they’re unlikely to care. Just don’t expect any feline help when it comes to tackling the dreaded dirty dishes. 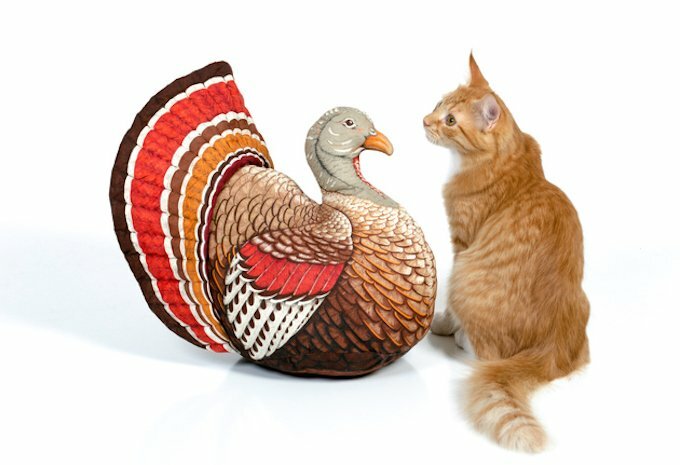 Has your cat feasted on a Thanksgiving meal? Let us know in the comments below!